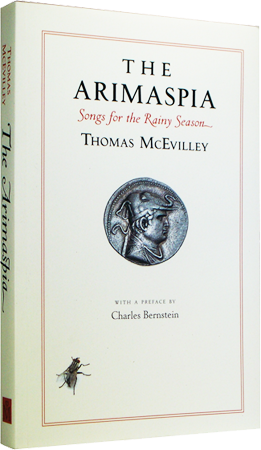 Thomas McEvilley was born in Cincinnati on July 13, 1939. He received his B.A. from University of Cincinnati and his M.A. from the University of Washington. He then returned to Cincinnati, where he received a Ph.D. in classical philology. He held a strong interest in modern art, reinforced by the modern artists of his acquaintance. He was an expert in the fields of Greek and Indian culture, history of religion and philosophy, and art. 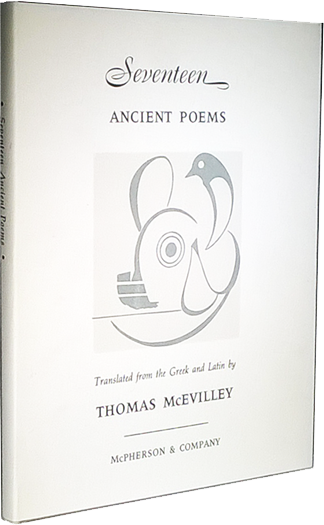 He published several books (including the monumental The Shape of Ancient Thought) and hundreds of scholarly monographs, articles, catalog essays, and reviews on early Greek and Indian poetry, philosophy, and religion as well as on contemporary art and culture. 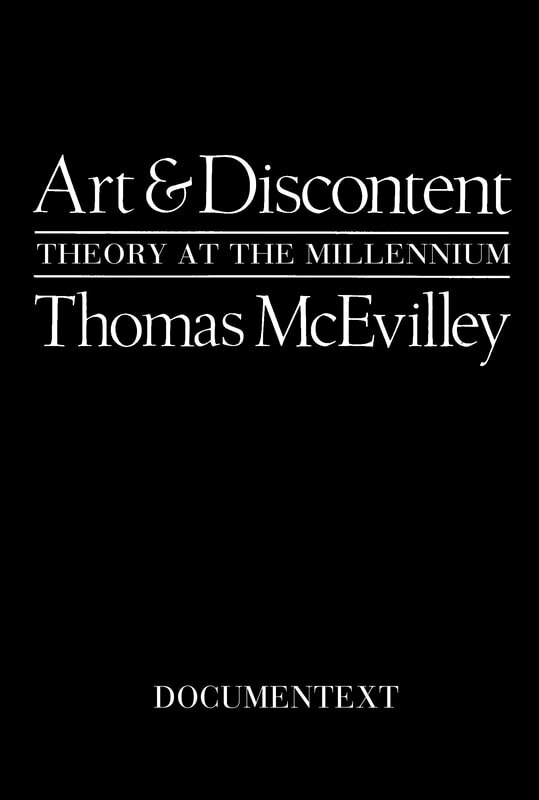 In the lingering wake of 1960s formalist thinking dominated by Clement Greenberg and Minimalism, Mr. McEvilley was a crucial alternative voice. He was among the first widely read critics of his generation to write about contemporary non-Western art at a time when it was all but unknown to the Western market. 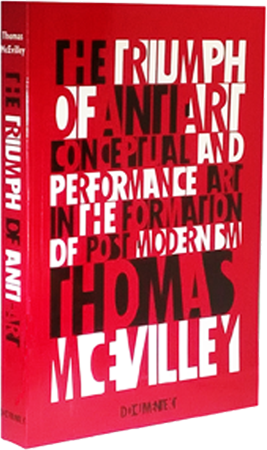 He received numerous awards, including the Semple Prize at the University of Cincinnati, a National Endowment for the Arts Critics grant, a Fulbright fellowship in 1993, an NEA critic’s grant, and the Frank Jewett Mather Award (1993) for Distinction in Art Criticism from the College Art Association. He was also a contributing editor of Artforum and editor in chief of Contemporanea. McEvilley died on March 2, 2013 of complications from cancer at Memorial Sloan-Kettering Cancer Center. He was 73. 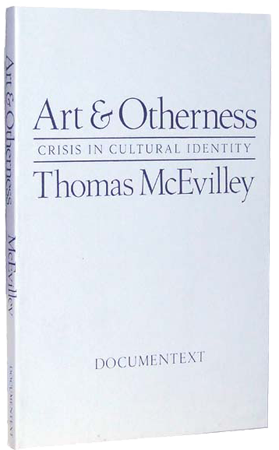 McEvilley's art monographs include works on Julian Schnabel, Les Levine, Pat Steir, Ulay and Marina Abramovic, Janis Kounellis, and Bruce Conner. He appeared in two parts of the BBC television series "The State of the Art." 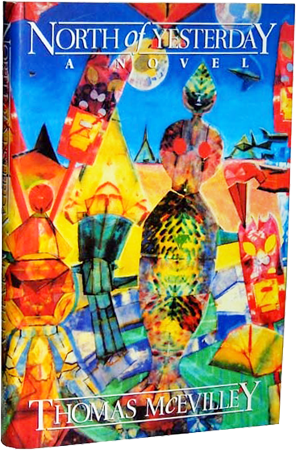 Selected books from other publishers: Fusion: West African Artists at the Venice Biennale, Berlin: Prestel, and New York: The Museum of African Art, 1994. Judith Schwarz and Arlene Stamp: Fictive Space, Calgary: The Alberta College of Art, 1994. Antoni Tapies, Barcelona: Fundacio Tapies, 1994. The First Act: The Spitzweg Icon Theft (With Ulay), Stuttgart: Canz Verlag, 1994. Diogenes of Sinope, Berkeley: Peter Koch, printer, 1994. Pat Steir, New York: Abrams, Spring 1995. 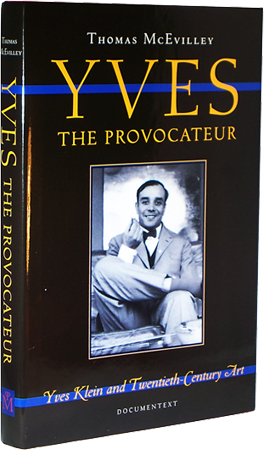 Catalogue publications: "Francis Alys," in exhibition catalogue, Gallery Ramis Barquet, Monterrey, Mexico, May, 1994. "The Death of James Lee Byars," in exhibition catalogue, James Lee Byars, Valencia, Spain: IVAM, 1994. "Here Comes Everybody," in exhibition catalogue, From Beyond the Pale, Irish Museum of Modern Art, 1994. 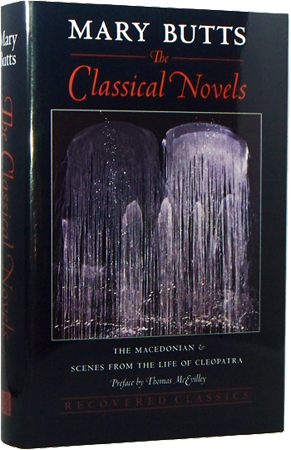 "Ovid Uman," exhibition catalogue, University of Wisconsin at Oshkosh, November, 1994. "Foreword" to catalogue 2 x Immortal: Elvis and Marilyn, Boston, the ICA, 1994. "Here Comes Everybody," revised version, in catalogue of First Johannesburg Biennale, February, 1995. "Jana Sterbark: Materials and Their Truth," Barcelona: Fundacio Tapies, 1995. "Is You In or Is You Out: Niko Pirosmani and Contemporary Art," Sign and Wonders, Zurich: Kunsthaus, 1995. "Inside Out: Ingeborg Luscher," Philadelphia: Moore College of Art and Design, 1995. "Sigmar Polke, Betrayed Lover," in exhibition catalogue Join the Dots, Liverpool, the Tate Gallery, 1995. "The Serpent in the Stone: Marina Abramovic," catalogue essay, Oxford: Museum of Modern Art, February, 1995. "Pollock and Siqueiros: Inverse Symmetry," Pollock and Siqueiros, Dusseldorf, the Kunsthalle, Spring, 1995. Articles and Reviews: "Medicine Man: Locating a Context for Wolfgang's Laib's Work," Parkett, 1994. "When the Stars Threw Down Their Spears," interview with Dominique Nahas, New York: MEANING, Fall, 1994. "Clement Greenberg: Cold Warrior, Frieze," September, 1994. "Openings: Pieter Schoolwerth," Artforum, January, 1995. "Luis Cruz Azaceta at the Alternative Museum," Artforum, January, 1995; "Lena Cronquist, Stockholm," Artforum, February, 1995; "Insite 94," Artforum, April, 1995. "Image Box, Skopje, Macedonia: Soros Center for Contemporary Art," Artforum, May, 1995. "Incidents of Travel in the Contemporary Art World," Trans 1, forthcoming, May, 1995. "Post Soviet Nomadic Art," Zurich and New York: Parkett, Spring, 1995. "Exhibited," curated by Vasif Khortun, The Center for Curatorial Studies, Bard College, Artforum, October, 1994. "African Art in the Collections of African American Artists," The Museum for African Art, Artforum, October, 1994. "Simon Shemov, Skopje, Macedonia, Museum of Contemporary Art, Artforum, May, 1995. Also: Preface, in Mary Butts, The Classical Novels, Kingston, NY: McPherson and Company, 1994; "Post- Modernist Aesthetics," forthcoming in The Encyclopedia of Aesthetics, New York: Garland Press, 1995. "Jainism and the Indus Valley," Jina Magazine, Toronto, 1995. Talks and lectures: "Plotinus and the Upanishadic-Vedantic Tradition," 5th International Congress on Vedanta, Miami University, Oxford, Ohio, August, 1994. Keynote Speaker, San Francisco Art Institute Annual Colloquium on Art Criticism, August, 1994. "Thornton Dial, Image of the Tiger," the Milwaukee Art Museum, September, 1994. Workshop Organizer and Moderator, "Ethnicity and Multiculturalism, Emancipation or Conflict?" International Association of Art Critics, Stockholm, Sweden, September, 1994. "A Four Point Plan for Post-Modern Art Criticism," International Association of Art Critics, Stockholm, September, 1994. Panel discussion, "Dislocations: Contemporary Art in Latin America," The Bronx Museum of the Arts, October, 1994. Keynote speaker, Sao Paulo Biennal Critic's Conference, "Confrontation of Cultures: The Presence of the Other," October, 1994.Panel, Insite 94, San Diego/Tijuana, October, 1994. "Neo- conservatism, Post-Modernism, and the Arts," Public Lecture, Cal Arts, Valencia, CA, November 1994. "Post Modernism, Post- Colonialism and the Arts," Irish Museum of Modern Art, Dublin, January 12, 1994. Panel discussion, "The Persistence of Primitivism," in conjunction with the show "Exhibition-ism," Museum for African Art, New York, October, 1994. "History, Quality, Globalism, II," Skopje, Macedonia: Museum of Contemporary Art, January, 1995; "Contemporary Issues," Ljubliana, Slovenia: Moderna Galleria, January, 1995; Workshop leader, First Johannesburg Biennale, Johannesburg, South Africa, March 1995; "Beauty and the Beast: Art and Politics," discussion with Dave Hickey, The Guggenheim Museum (downtown), New York City, April 26, 1995. Discussant, 10th Annual Conference on African Art, New York City, April 1995. Juror, "Image Box," Soros Center for Contemporary Art, Skopje, Macedonia, January, 1995. 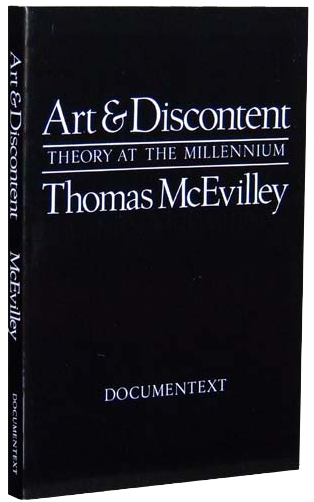 In addition to teaching at Rice University for many years, McEvilley lectured in the MFA Program in Sculpture, Yale School of Art, September 1994 and the Department of Painting, Yale School of Art, April 1995. He was a visiting professor at The Graduate Center, CUNY, in the Spring of 1995.